The Supreme Court of India on Friday, dismissed an appeal by a death row convict, and held that Section 364A awarding death penalty as a possible punishment, for kidnapping any person threatening to cause death in order to compel Government or any other person, to pay ransom , is not unconstitutional. Three Judge bench of Justices T.S. Thakur, R.K. Agrawal and Adarsh Kumar Goel examined the background of the Section 364A and held that it was enacted for the safety and security of the citizens and the unity, sovereignty and integrity of the country. You may read the Live Law report and judgment here. 18 years after a massive fire at a theatre in New Delhi’s posh Green Park area snuffed out 59 lives, the Supreme Court on Wednesday let off cinema owners Sushil Ansal and his brother Gopal Ansal merely asking them to pay a fine of Rs 30 crore each to the government within three months. Read Judgment and Live Law report on it here. 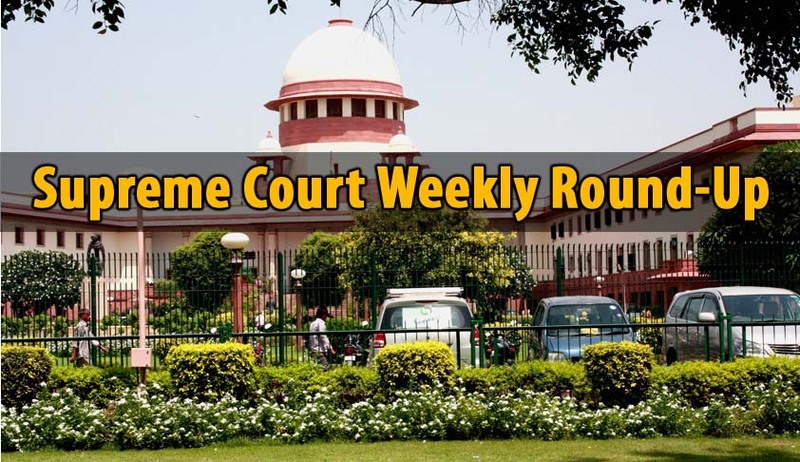 In another judgment, the top court also held this week that, Police can seek Custody of Accused who are arrested even after filing of Charge Sheet. The court was considering a case related to killing of nine persons and injuries to large number of villagers of Village Netai of District Paschim Medinipore in West Bengal. You may read the Live Law report on it here. A Supreme Court Bench [Chitra vs. State of Kerala & Ors] comprising Justice Vikramajit Sen and Justice Shiva Kirti Singh, while ordering refund of license fee due to non-utilization of license for full term, in the event of unforeseeable circumstances, observed that no person can be prejudiced because of an act of a Court. The Food safety regulator FSSAI plea against Bombay High Court order staying its 2013 advisory requiring manufacturers to take approvals for the products already in the market, was not entertained by Supreme Court .Dismissing the plea, Supreme Court bench of Justices J S Khehar and C Nagappan said “No ground for interference is made out, in exercise of our jurisdiction under Article 136 of the Constitution of India. The special leave petitions are accordingly dismissed,”. The Apex Court reminded the courts that while imposing sentence, a Court has a duty to respond to the collective cry of the society. The Apex Court said that the agony of the victim or the survivors of the victim cannot be brushed aside. Contempt of court notice was issued to the Commissioner of Delhi Police.A Bench of Justices J Chelameswar and A M Sapre was shocked and disappointed by the ‘lecture’ given in the report filed by a senior official of Delhi Police’s south district on the manner in which the police functioned although it had failed to execute the arrest warrant issued by the Apex Court. In a major step towards curbing road accidents, a Supreme Court appointed committee on Wednesday asked all the states to suspend license of traffic rule violators, even for over speeding and red light jumping, for a minimum of three months. A social justice bench of the Supreme Court comprising Justice M.B. Lokur and Justice U.U. Lalit rapped the States for failing to make use of a staggering Rs 27,000 crore collected in the form of cess for the welfare of the construction workers. This money, the Court reportedly noted, is spent on administration and advertisement and hardly anything reaches the poor. The Supreme Court , transferred a Public Interest Litigation filed by Dalit Victims of Mirchpur Village, to Punjab and Haryana High Court, to look into their rehabilitation. The Social Justice Bench comprising Justices MB Lokur and U U Lalit, however clarified that the HC would deal only with rehabilitation. The Supreme Court on Thursday picked holes in the new liquor policy of Kerala, which plans to gradually moving towards prohibition, to confine liquor licenses only to 26 five star hotels in the state and asking the three and four star bar owners to open wine and beer parlours. Search Engines violating court order ? SC Judges Library, the Second Largest Library in Asia, now available online, can be used by Supreme Court Lawyers. The Judges’ Library is the second largest Library in Asia and has the privilege and pride to be an extremely loaded and resourceful repository of legal content. By way of digitization and web presence, access has been thrown open to Members of the Bar.